August 16th, 2012: Media gather outside the Ecuadorian Embassy, where founder of WikiLeaksJulian Assange is residing. Julian Assange has been granted political asylum by Ecuador, two months after he took refugee in he country’s embassy in London. Mr.Assange has been fighting extradition from the U.K. to Sweden on allegations of sexual misconduct. but U.K’s Foreign Secretary William Hague said his country would not allow safe passage to Assange out of Ecuador’s embassy. Ricardo Patino, Ecuador Foreign Minister does not agree and says his country is seeking to negotiate with Great Britain over the releasing arrangements. 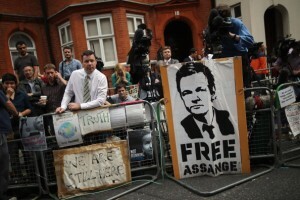 Mr. Assange has been staying inside Ecuador’s embassy in London over the past sixty days to avoid extradition to Sweden. He faces questioning in Stockholm on charges of sexual offenses against two female former Wikileaks volunteers. Julian Assange denies the charges and says the allegations are politically motivated. However, Great Britain insisted it has a legal obligation to extradite him and said the embassy’s diplomatic status could be lifted. Patino interpreted this as an “open threat” to let London police storm Ecuador’s embassy and capture Assange. Under international law, an embassy is considered foreign country territory. Mr. Assange is an Australian national. In 2010, he published a mass assemblage of leaked diplomatic cables on his website that embarrassed several countries, especially the United States. Assange fears Sweden will eventually handed him to the U.S. In the meantime, the Swedish government reacted angrily to the assumption by Ecuador that Mr. Assange would not be given a fair trial on Sweden soil and wanted Ecuador’s ambassador to explain. “It is unacceptable to halt the Swedish judicial process and European cooperation,” said Anders Joerle, spokesman for the Swedish foreign ministry. Julian Assange entered Ecuador’s embassy in June while on bail, after his bid to reopen an appeal to extradition failed in the U.K.’s Supreme Court. Subsequently, Ecuador offered to allow Sweden investigators question Assange inside its embassy but it was rejected. Experts say political asylum does not equal immunity from prosecution. Whatever the outcome, the process is expected to go on for months while legal avenues are exhausted. Although granted asylum, Julian Assange still needs safe passage through U.K.’s territory; a safe-conduct that he won’t get.